By now we can very well say that nano scale machines and devices is what the future holds for us. The major advantage of ultra small devices is that they require very little energy to work because of their small scale. Energy is everywhere in various forms, although it is either difficult to harness or very little to be useful for any purpose. Since 2005 scientists have been working on developing self-powered nanotechnology, aiming at building a self-powered system that operates independently, sustainably, and wirelessly by itself without using a battery. Recent development from team of scientists on the project working with DARPA and Department of Energy were published on a journal called 'ACS Nano Letters'. They state the development of what they say is the world's "first self-powered nano-device that can transmit data wirelessly over long distances." The tiny device is able to operate without any batteries, using a piezoelectric nanogenerator to create electricity from naturally occurring mechanical vibrations. The technology has thus made it possible to scavenge energy from the sources in the environment such as gentle airflow, vibration, sonic wave, solar, chemical, and/or thermal energy. This will make it possible to develop self sustaining devices that will work by harnessing tiny amounts of energy around them. We can have endless possibilities and a wide variety of applications. How the nano wireless device works? As you can see in the picture the device consists of 3 components. 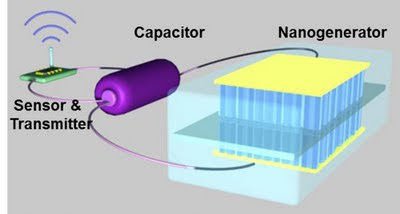 A Nano Generator, capacitor and a wireless trans-receiver. The nano-generator is made from a flexible polymer substrate, with zinc-oxide (ZnO) nanowire textured films attached to that polymer's top and bottom surfaces. It has electrodes on the outside surfaces of the nano-wire films. Its piezoelectric in nature, when mechanically strained by vibrations, it produces an output voltage of 10 volts and an output current of over 0.6 microamps, (corresponding volume current density 1 mA/cm3 and power density 10 mW/cm3). Energy is stored in the nanodevice's built-in capacitor and is used to power electronics including an infrared photon-detecting sensor and a radio transmitter. In fact the device has enough energy to actually transmit a radio signal detectable by a commercial radio in a range of 5-10 meters (30 Feet), comparable to what a present day Bluetooth headset can do. The possibilities for these kind of nano devices are endless. It can have Applications ranging from remote surveillance and military to medical and everyday gadgets, giving us the ability to create devices that work and stay up all by themselves without us even having to think about changing batteries.